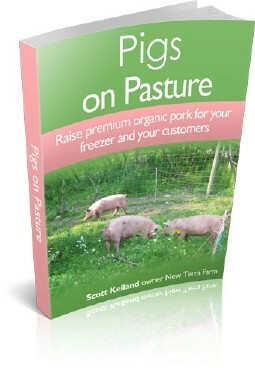 "Sell Premium Pork From Raising Pigs on Pasture"
Raising pigs on pasture is a great business for the small land owner! With the right system, there is minimum overhead, low labor requirements, and no long-term commitment. Raising weaner pigs on pasture to finish weight offers a great opportunity for a small farmer to diversify farm income without a huge investment in facilities or time. At New Terra Farm we have been raising piggies this way for 10 years. We have raised tons of premium pork for our freezer and our farm customers. We use our piggies to renovate pasture, prepare land for planting, and for fall cleanup in our market garden. Pigs are multi-purpose farm livestock, once you have a system to handle them. The pork produced from pastured pigs is a premium product; we easily sell all we can raise to our CSA customers, at a price we set to guarantee a profit. Once people get a sample of what REAL pork tastes like, they will come back year after year. without polluting or damaging your land; in fact we use our pigs to improve our land! We will show you step-by-step how to raise pigs on pasture to put meat in your freezer (and money in your wallet!) This is a great family business, too. The kids can help out with chores and even raise pastured pork as a summertime job to earn extra money. Our system is easy enough for kids to follow it successfully. What do you get in "Pigs on Pasture"? We put in everything we have learned in 12 years on raising pigs on pasture here at New Terra Farm. The result is a simple but comprehensive system to market and manage your pastured pigs, sustainably and profitably. Planning – How many pigs should you start with? Marketing – How will you sell your piggies? What do you get back from the abattoir? What can you sell your pigs for? "Pigs on pasture" is the actual record of the system we have used successfully for 10 years to raise delicious pastured pork. All the instructions, the photos, and the examples used are from right here at New Terra Farm - no theories, just practical pig-raising advice.